This week a Qantas jet flew from the United States to Australia using biofuel generated from Brassica carinata (carinata). This event was just one of several exciting developments involving carinata that have happened over the past year. Strong markets exist for the fuel, co-products and meal that can be produced from carinata seed. This is creating an opportunity to establish carinata as a winter crop for producers here in the Southeastern U.S. To accelerate the establishment of commercial carinata production in the southeastern US, a consortium known as the Southeastern Partnership for Advanced Renewables from Carinata (SPARC), will work to address barriers to production, and reduce risk along the supply chain. 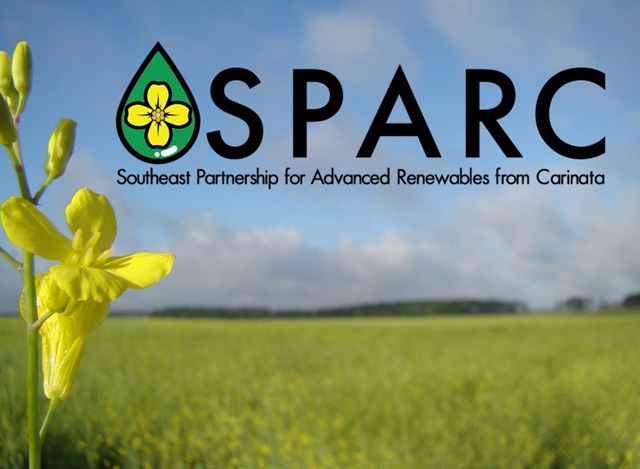 The SPARC team is comprised of scientists from several Southeastern universities, government agencies, industry (Agrisoma Biosciences Inc., and Applied Research Associates Inc.), and a consortium representing the commercial aviation industry. The establishment of this team was made possible with support from the U.S. Department of Agriculture’s (USDA) National Institute of Food and Agriculture (NIFA). “Our goal is to commercialize Carinata to produce jet fuel and feed for livestock while mitigating risks along the entire supply chain,” says David Wright, project lead and an agronomy professor at the University of Florida. In this article, two key objectives of the SPARC feedstock development team are highlighted: to assist with the selection of varieties suited to the Southeastern U.S., and to optimize the cropping systems fit of carinata with traditional crop rotations. Over the past 5 years, scientists at the University of Florida and Agrisoma have been screening advanced carinata varieties to identify high yielding, early maturing, cold hardy, and disease tolerant varieties, with high oil content, and desirable fatty acid composition. As a result, several varieties have been identified that provide opportunities to increase carinata seed yield by 40%, and increase oil yield by 2%, over existing commercial varieties. After benefiting from several years of selection and testing in the region, Agrisoma’s breeding pipeline of varieties promise even higher yielding, earlier maturing varieties, that would complement prevalent summer crop rotation systems in the US Southeast. Successful commercialization of carinata based renewables will depend on reliable and sustainable year round availability of feedstock; therefore expansion of carinata production across the Southeastern U.S., as determined by adaptability, will strengthen the supply chain. 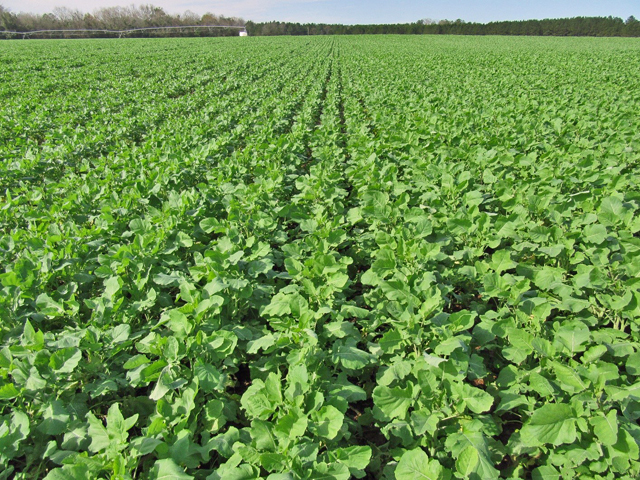 To establish the suitability of locations in the Southeast for carinata production, SPARC cooperators planted 16 advanced carinata breeding lines that have potential for near future commercial deployment at 15 locations in Alabama, Florida, Georgia, Mississippi, North Carolina and South Carolina. This multi-site regional testing approach will assess the yield potential, determine production sensitivity to resource management and climate variables, and identify productive regions for commercialization and supply chain development. This regional study is already yielding useful information about these advanced lines. The cold weather at the start of the 2018 year provided a major test of the resilience of the varieties against cold damage. This information will be key to selecting the next commercial varieties for the Southeastern U.S.
As commercial carinata acreage expands from the Panhandle of Florida to more northern states in the Southeast, it is important to determine the latitudinal limits of winter production, and quantify cultural practices that enhance cold tolerance. Tillage practices are expected to play an important role in the degree of frost tolerance of carinata due to the maintenance of crop residue on the soil surface which may protect the crop from freeze damage, and due to differences in soil temperature during establishment. Integration of fertility management is important on the characteristic sandy soils of the Southeast in order to meet crop demand as well as limit nutrient movement to water bodies and groundwater. Fitting carinata into current crop rotations will provide growers with additional income, but rotations that are economically and agronomically feasible are still being investigated. Existing common cropping systems in the Southeast include corn, cotton, peanut, soybean, and sorghum. The selection of regionally appropriate cropping systems for double cropping carinata is currently limited by the planting and harvest window of summer cash crops. Research on early maturing carinata lines, combined with harvest management practices ideal for the Southeast, will help overcome that limitation. Integration of tillage, fertility, and rotations for sustainable carinata production may provide enhanced ecosystem services for water quality, carbon sequestration, and integrated weed management. 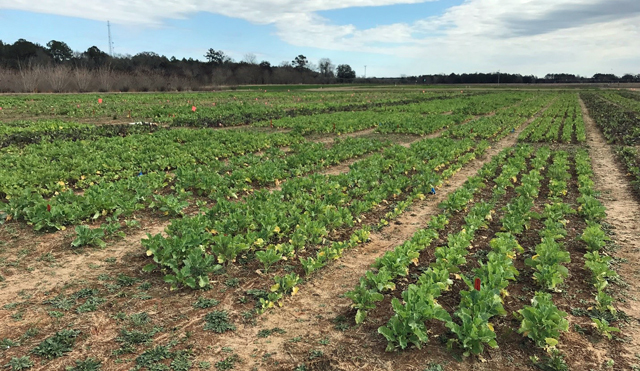 The effects of previous summer crops on carinata production, as well as the effects of carinata production on subsequent summer crops, will be determined in two long-term cropping systems studies in Jay and Quincy, Florida. Researchers will determine regions suitable for sustainable carinata production in the Southeast, and identify those rotations that are both economically and agronomically viable. Tillage effects on frost tolerance of carinata will be quantified, and recommendations will be developed and extended to growers and industry professionals through field days and workshops.